Meet Sherman W. "Whip" Saltmarsh Jr.
A lifelong resident of Winchester, Sherman W. “Whip” Saltmarsh, Jr. is the founder of the Saltmarsh Insurance Agency and leader of a team of dedicated insurance experts that have managed the evolving insurance needs for three generations of families and businesses throughout New England—for more than fifty years. Saltmarsh has served the community, state and region in which he lives through a distinguished 43-year career in public service, including 14 years as a State Representative in the Massachusetts House of Representatives. Saltmarsh authored crucial legislation and secured federal funding for transportation, economic development, finance, public works and education programs that continue to spur municipal, statewide and regional growth today. Saltmarsh also demonstrates his devotion to public service through his membership to a variety of committees. Saltmarsh, a graduate of Boston College, was elected to the Boston College Hall of Fame in 1991 for leading the B.C. hockey team from 1950 through 1953. He is a Founding Member of the Flynn Fund (formerly the Blue Chips) of Boston College. 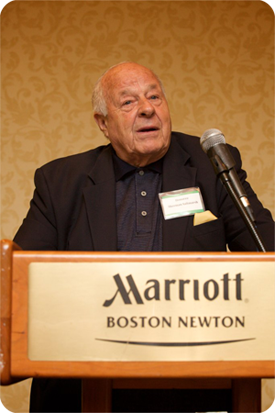 He has served as Treasurer for the Boston College Varsity Club in 1966 and the President of the Pikes Peak Club in 1967 as well as serving as an Executive Committee member for the New England Association of Schools & Colleges. Saltmarsh is a member of the Selection Committee for the Boston College Athletic Director. In 1952, Whip Saltmarsh played in the first ever Beanpot Tournament. Whip Saltmarsh’s love for sports has made him proud to offer assistance to the Winchester Athletic Department. His commitment to youth sports and education programs has been noted in the awards he has received for going above and beyond to help high school athletics. He has provided many donations for the Winchester High School fields, scoreboards, auctions and sports advertising. He has arranged for the Winchester High School Varsity Hockey team to play two league games at Boston College including the 2010 Division Championship games vs. Woburn. Saltmarsh has received numerous awards for his outstanding contributions and distinguished service in the public and private sectors. Saltmarsh was instrumental in securing more than $30 million dollars in state grants for total revitalization of downtown Winchester during his tenure as State Representative. He also authored legislation for the Off Street Parking Program which was authored in the Legislature by Representative Saltmarsh, a $2M grant to purchase the down town railroad station from the MBTA to reconstruct the parking lot opposite town hall and enlarge parking lot opposite the post office. Whip and his wife, Ruby, a fourth and fifth grade teacher in the Stoneham Public School System, continue to live in Winchester, Massachusetts and are active in local charities and volunteer programs.